Looking for the perfect chocolate cupcake recipe? Well these super moist and easy chocolate cupcakes are sure to satisfy your tastebuds! These cupcakes have a beautiful texture and are slightly fudgy. The Chocolate Swiss Meringue Buttercream works perfectly as its not too sweet and has a really smooth/silky consistency, making it a delicious after-dinner (or anytime!!) treat! Read on to get the recipe! Its been a looong time since my last post! Firstly, how quick has time gone (well, for me anyway!) and secondly, a lot has changed in my life in the last year. My husband and I found out about 14 months ago that I was expecting our first child, and not long after the nausea kicked in! I was blessed to not have had much morning sickness, but just the toll on my body of being nauseous, then tired, then eventually swollen feet and sore back basically kept me out of the kitchen for the entire pregnancy (cheers to my hubby for being AMAZING during that time!). I craved mostly savoury food as well, so I just had to roll with that! That was 6 busy months ago, and while things are no less busier I've finally come to the point where I'm ready to start baking again - yay! I've recently been trying out a few recipes to find a chocolate cake that wasn't too crumbly; one that was suitable for layered cakes, as I'm planning to branch more into speciality cake orders. A classic mud cake is amazing, but I also wanted to have the option of a chocolate sponge-type cake. Cue...my Ultimate Chocolate Cake! 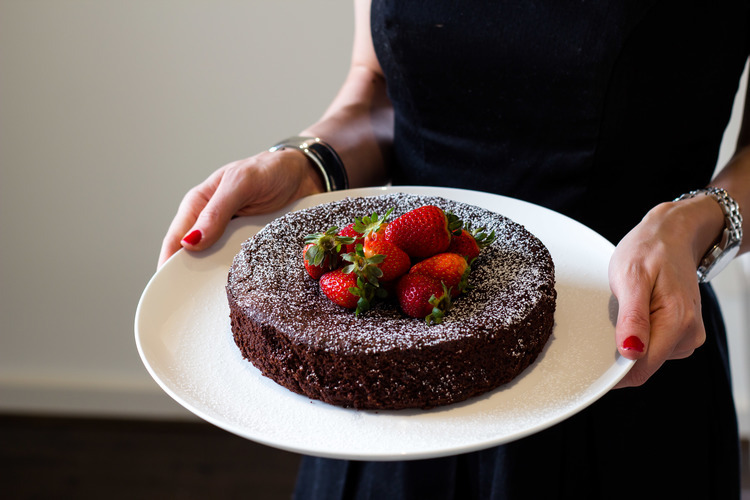 *Update: read more about my Ultimate Chocolate Cake Recipe here! I also wanted to have a go at making Swiss meringue buttercream. Unlike regular buttercream (using icing sugar, butter, milk, etc), Swiss meringue is less sweet, more silky and smooth in texture. It requires a little more work than regular buttercream, as the eggs and sugar need to be whisked together over boiling water until the sugar has dissolved, but its still really easy to make - and I think it pays off in the end! I found it easier to use a stand mixer to make the buttercream. Though it can be done with a hand-mixer, it would just be tiresome holding the beater for about 10 minutes! You'll have to excuse my piping in the pictures - I know its a little rustic! It was late at night and the icing was a bit soft. If the icing is too soft, just pop it in the fridge for a few minutes and it will be perfect. Swiss meringue buttercream holds up in the fridge really well and can be made ahead of time. When ready to pipe on cupcakes, just take it out the fridge for about an hour until its a spreadable consistency and beat slightly using the paddle attachment to make it nice and whippy again. 1. Preheat oven to 180˚C. Line 2x 12-hole muffin pans with cupcake liners. Sift dry ingredients together in a bowl and use a which to combine. Set aside. 2. In the bowl of a stand mixer, fitted with a paddle attachment, beat sugar, butter, eggs and vanilla, until light. 3. With mixer on low speed add a third of the dry ingredients, followed by half the liquids and repeat, ending with the dry ingredients. Mix well until combined. 4. Pour the mixer into lined cases and bake for about 15-20 minutes, until centres are done. 5. Remove from oven and place cupcakes on a wire rack to cool. Ice with buttercream once cooled. Store in an airtight container in the fridge. Remove from fridge about 1-2 hours before serving. 1. Using the bowl from your stand mixer, place eggs and sugar in bowl and set over a bowl of simmering water (making sure bowl doesn't touch the water). Whisk continually until sugar has completely dissolved. 2. Remove bowl from heat and place on stand mixer. Using whisk attachment, beat on high speed until the bowl is completely cooled (about 10 minutes). Add vanilla while beating. 3. Once cooled, add the cubed butter, one at a time until its all combined. 4. Remove bowl from stand and fold in melted chocolate with a rubber spatula. At this point the buttercream is ready to be piped. You can place in the fridge for a few minutes to make it slightly firmer and easier to pipe.